Alpine Shelter Skuta — erin pellegrino. 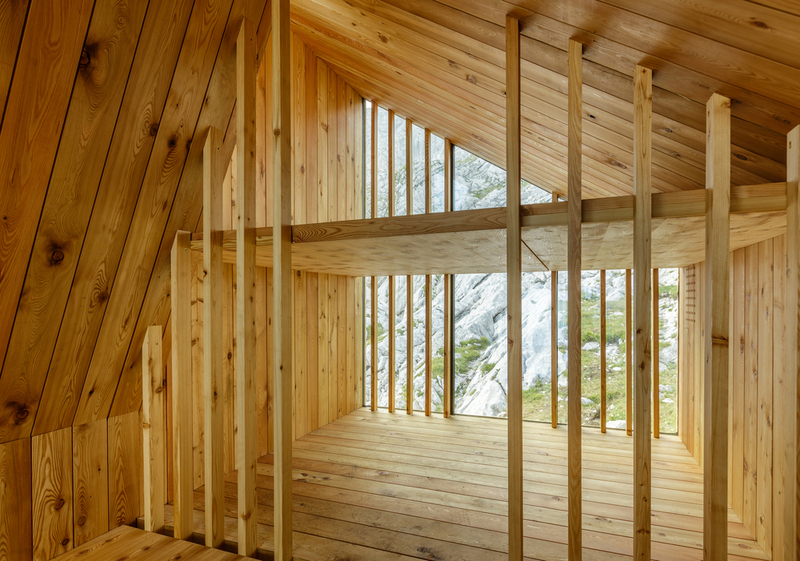 Designed for an alpine site on Skuta Mountain in Slovenia, this cabin offers an intimate refuge for eight visitors nestled in the scenic Alps. The building shifts its roof line like a series of mountain peaks, shedding snow and framing distant scenes. The design minimizes environmental impacts: visually, gray, glass reinforced concrete cladding blends into the mountain’s stone, and performatively, natural ventilation, robust insulation for cold nights, and a lack of electricity preserve the shelter’s natural setting. With a minimal footprint. the design consists of three modules, in part to allow for transport and also to programmatically divide the space. Deployed by helicopter as three modules, the building was joined onsite into one mass. The first module is designated for entry, storage and preparation of a modest dinner. The second module allows for both sleeping and socializing, with beds that face each other for communal eating and gathering. The last is module is mainly for sleeping, offering two levels of bunks. From both sides of the shelter, one can experience the panoramic views of both Skuta, the valley, and the city of Ljubljana. In contrast to the thick gray cladding of the exterior, the interior is a warm wood. Sited in the Slovenian Alps, the bivouac is a shifting series of peaks, blending seamlessly with the surrounding environment and providing scenic views for mountaineers who venture inside. Collaboration with with OFIS Arhitekti, Frederick Kim, Katie MacDonald, AKT II, Rieder Smart Elements, and the Harvard Graduate School of Design.